Yesterday I posted a long look at the NYR forwards' matchups and results, from a unique competition visualization tool created by some nobody (@petbugs13). Today is NYR defensemen day! I'll repost the "key" PB provided - you'll want to keep this picture handy so you can review it when looking at the rest of this post. Remember: when looking at the results, in general, we want to see a player producing positive results on the y-axis. In those cases, the player is performing better than we would expect against that opponent or that match-up. Yesterday's post reviewed the 2017 season-to-date results for NYR forwards, and today we'll look at the NYR defensemen results. All data is 5v5, score and venue adjusted from NaturalStatTrick. As with yesterday, here are the summaries. Not really surprising that McDonagh and Holden have matched up the most, since that's clearly Vigneault's preferred shut-down pair. Smith "matching" up against the "better" quality forwards by shot differential is probably an anomaly due to the lesser amount of time he's played. Looking at performance, there's a lot more blue (negative) here, than green (positive). Again this means that these NYR defensemen are generally underperforming their expected results against the opposition forwards. McDonagh is the only defensemen who doesn't show any real signs of underperformance. Kampfer's in a world of his own, as you'll see below. One thing I forgot to mention yesterday: We see a fair amount of players (Hayes, for example), underperforming against "worse" quality (negative shot differential) opposition, and exceeding expectations against "better" quality (positive shot differential) opposition. This is the reverse of the norm - players tend to perform better against the lesser opposition. Maybe there is a reason for these odd results, or maybe (and this is my instinct), this is just an "early season" "small sample" result. We'll see if this holds up as the season continues. Looking at how the NYR defensemen have matched up against opposition defensemen now. I would put even less value on this - I don't recall any evidence that coaches focus their defensive utilization on the other team's defensemen - so I wonder if this is mostly circumstance. But, regardless of the matchups, overall, the NYR defensemen have been terrible against the other team's defensemen. Staal, Smith, Kampfer and Skjei all underperforming, to various degrees. The specific player details follow. Matchups: Very neutral - Staal has not been particularly sheltered or matched against opposition forwards. Performance vs Comp (Opponent's TOI): Staal's had neutral to poor results against low and TOI forwards. Performance vs Comp (Opponent's CD): Staal has perfomed negatively against "worse" players, and basically as expected against "better" players. Performance vs Matchups: Staal's slightly underperformed on average against the opposition forwards he is avoiding and he is matching against. Staal Summary: Staal's underperforming, but he's still probably overperforming our expecations coming into the season! Matchups: Staal's not been particularly sheltered or matched against opposition defensemen. Performance vs Comp (Opponent's TOI): Staal's been slightly underperforming against high TOI defensemen. Performance vs Comp (Opponent's CD): Staal's seriously underperformed against "worse" opposition forwards, but again basically performs as expected against "better" opposition forwards. Performance vs Matchups: Staal's slightly underperformed against the opposition defensemen whether he's avoiding them or matching against them. Matchups: Shattenkirk has been slightly sheltered against opposition "better" quality forwards (this is probably unintentional). Performance vs Comp (Opponent's TOI): Shattenkirk's performed well against low TOI forwards, and less so against high TOI forwards. Performance vs Comp (Opponent's CD): Shattenkirk's exceeded expectations against "worse" quality forwards, and basically been neutral against "better" quality forwrds. Performance vs Matchups: Shattekirk's generally performed above expecations against forwards he's avoided, and basically broken even against his matchups. Shattenkirk Summary: If Shattenkirk can continue to hold his own against the tougher opposition forwards, and beat up on the lesser-quality opposition forwards, I'd be very happy. Matchups: Shattenkirk is slightly sheltered against opposition defensemen. Performance vs Comp (Opponent's TOI): Shattenkirk's broken even against both high and low TOI defensemen. Performance vs Comp (Opponent's CD): Shattenkirk's performed as expected against both "better" and "worse" quality defensemen. Performance vs Matchups: Shattekirk's basically neutral against his matchups, and his avoided opposition defensemen. Shattenkirk Summary: Shattenkirk's performed as expected against opposition defensemen - which I will take if he continues to produce points. Matchups: Not surprising to see McDonagh showing some slight matching against opposition forwards, but it is slight. Performance vs Comp (Opponent's TOI): McDonagh has performed as expected on average, with slightly better performance against high TOI forwards. Performance vs Comp (Opponent's CD): Similar results for McDonagh against "worse" and "better" quality opposition forwards. Performance vs Matchups: McDonagh has broken even against the opposition forwards he's avoided and matched up against. McDonagh Summary: McDonagh has basically met expectations against opposition forwards. Imagine what he could do with a complimentary partner! Matchups: McDonagh shows no sign of being matched against opposition defensemen. Performance vs Comp (Opponent's CD): McDonagh has slightly underperformed against "worse" quality defensemen and slightly overpeformed against "better" quality defensemen. Performance vs Matchups: McDonagh has broken even against his matchups, and overperformed against the opposition defensemen he's avoided. McDonagh Summary: Solid results from McDonagh. Matchups: Smith's been slightly matched against "better" quality forwards, but I'd guess this is unintentional, since we've seen few other examples of players matched up this way. Performance vs Comp (Opponent's TOI): Smith has underperformed against high and low TOI opposition forwards. Performance vs Comp (Opponent's CD): Smith has also underperformed against "better" and "worse" quality forwards. Performance vs Matchups: Smith been slightly underperforming against his matchups. Smith Summary: Smith's slow start seems reflected in these underperforming results against opposition forwards. Matchups: Smith had mostly neutral matchups against opposition defensemen. Performance vs Comp (Opponent's CD): ...and against opposition defensemen of all quality. Performance vs Matchups: More negative performance for Smith, especially against his matchups. Smith Summary: Smith needs to improve, pronto. Matchups: Kampfer has received mostly neutral matchups. Performance vs Matchups: .....bbblllllle against opposition forwards. Kampfer Summary: Did I mention how terrible Kampfer's been? Matchups: Kamper has been just barely sheltered against high TOI defensemen. Performance vs Comp (Opponent's TOI): Kamper's been just "bad" against opposition defensemen. Performance vs Comp (Opponent's CD): Kampfer's underperformed against opposition defensemen of all quality. Performance vs Matchups: At least Kampfer has just "reasonably" underperformed his matchups, I guess? Kampfer Summary: Compared to his terrrrrible results against opposition forwards, Kampfer's only been terrible against opposition defensemen. Gotta keep moving those goalposts! Matchups: Holden has been slightly matched against "better" and high TOI opposition forwards. Performance vs Comp (Opponent's TOI): Holden has managed to break even against high TOI forwards. Performance vs Matchups: Holden has been on average neutral against his matchups and the opposition forwards he avoids. Holden Summary: A "neutral" performance from Holden is probably a win. Matchups: No sign of Holden being matched against opposition defensemen. Performance vs Comp (Opponent's TOI): Holden's generally overperformed his expectations against high TOI defensemen. Performance vs Comp (Opponent's CD): Holden's generally met expectations against "worse" and "better" quality opposition defensemen. Performance vs Matchups: Holden's generally met expectations against his matchups and the opposition defensemen he's avoided. Holden Summary: Not much to complain about from Holden here. Matchups: Skjei hasn't been matched against opposition forwards. Performance vs Comp (Opponent's TOI): Skjei has slightly negative results against opposition forwards. 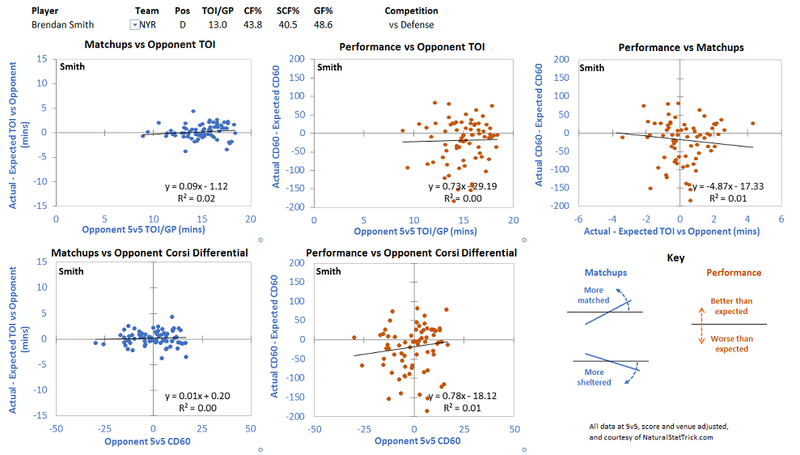 Performance vs Comp (Opponent's CD): Skjei has met expecatations against "better" and "worse" quality forwards. Performance vs Matchups: Skjei has slightly overperformed the opposition forwards he avoids, and slightly underperformed his matchups. Skjei Summary: Skjei generally met expectations against opposition forwards. Matchups: Skjei has been slightly sheltered against opposition defensemen. Performance vs Comp (Opponent's TOI): Skjei has underperformed against both low and high TOI opposition defensemen. Performance vs Comp (Opponent's CD): Skjei has had worse results against the "better" opposition defensemen. Performance vs Matchups: Skjei has basically been slightly negative against all opposition defensemen. Skjei Summary: Skjei has slightly underperformed as a whole against the opposition defensemen. I take even less from these results than I did from the NYR forwards' results. It is still early in the season, and we've seen some unexpected performances from Smith, Holden, and maybe even Staal. But how about that Kampfer, huh?